FedSmith recently asked readers what they were doing during the partial government shutdown. A number of readers submitted comments as well as participating in the informal survey. 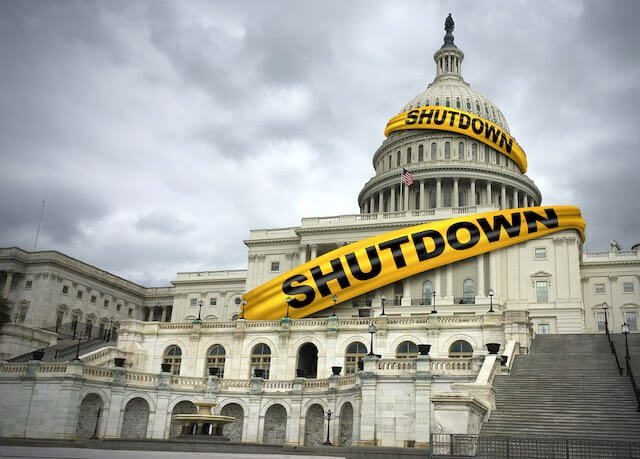 Unfortunately for those not receiving a check, a legislative attempt by Republicans to pay furloughed workers while keeping the government closed was opposed by the House majority. Those essential federal employees working or furloughed without an approved appropriation will not be paid until after the shutdown ends. The Democrats are expected to pass a funding bill to reopen the government until the end of February but it is not expected to pass in the Senate. In other words, the shutdown is continuing. Those federal employees impacted by the political stalemate will not be paid, apparently, until the stalemate is resolved. Among those who responded to this survey, 62% have been furloughed and about 38% have not been. About 49% were excepted and have to work and about 51% were non-excepted. Will You Consider Private Sector Employment? Perhaps the most interesting answer was to the question: Has the shutdown led you to consider working in the private sector? As we know from the “quit rates” for federal employees, most federal workers stick with their federal job. Compared to the private sector, the federal workforce is considerably more stable with a lower quit rate. But, in response to this question, about 49% of respondents indicated they are thinking of taking a job in the private sector and leaving federal service. More than 56% of those who have been furloughed indicated they are considering working in the private sector. We can assume that if the shutdown does go on for another month or more, some of the 51% of people who indicated they are not considering a move to the private sector may reconsider their status. People who are working but not getting paid, or people who are not working but will eventually get paid, start getting antsy. Hopefully, most readers have an emergency fund to carry them over during a shutdown. But, even those who have been saving for the proverbial rainy day are starting to get nervous about the lack of income. Only 7% of all respondents indicated they have applied for a loan. About 9% of respondents that were furloughed have applied for one. That number will certainly go higher during a continued shutdown with a lack of income. On the other hand, federal employees are withdrawing money from the Thrift Savings Plan (TSP). Data from the TSP show a 34 percent increase in hardship withdrawals in the two and 1/2 weeks after Christmas compared to the previous year. The data extend through January 14th, the first weekday after many federal employees missed a payroll check. About 11% of respondents indicated they have sought outside employment to provide extra income during the shutdown. 15% of those who have been furloughed have sought outside employment. The jobs people have taken included driving for Uber or Lyft, delivering pizza, working in a factory, working for Amazon, cleaning houses and doing part-time work for Home Depot and Lowes. One reader said that he took a job as an engineer in a private company. Perhaps the most interesting outside job was a federal employee who is working as a ski technician during the winter skiing season. Many more readers wrote they are still working for the federal government without receiving a paycheck. Have You Applied for Unemployment Benefits? More than 20% of those who are furloughed indicate they have applied for unemployment benefits. Among all respondents, more than 13% have applied for unemployment. Setting Up A Go-Fund Me Account? Only one respondent indicated he or she established a Go Fund Me account seeking money during the partial government shutdown. An actual search of the GoFundMe website shows a much more active federal workforce seeking money online. A quick search of federal employees on the GoFundMe page lists 1,953 federal employees or organizations seeking money for federal employees (as of the time of this writing). A few of these employees have been successful in raising several thousand dollars. Many others have raised a few hundred. Most have not been successful. The listing also includes several organizations raising money for federal employees. A federal employee named “Nila” wrote she works in Baltimore and can’t pay her bills but is still working. She has raised $5,855. A Department of Agriculture employee in Fort Washington, Maryland wrote, ” I hate to appear as though I am begging, however this is a (sic) emergency. I really don’t want to defult on my bills which will be detrimental to my credit score. If you can donate anything I am greatful (sic).” He has raised $2,475 as of the time of this writing. One person is seeking $800,000,000 with $5 raised in the first week. The purpose of the request is to provide $10,000 for each of the 800,000 federal employees who have not received a paycheck during the furlough. No name is listed on the request, but the location is listed as Fort Pierce, Florida and features a photo of a woman holding an NTEU sticker in front of a federal building. Perhaps the posting was meant as a publicity stunt or just wishful thinking. In addition to the lack of success for most of those asking for money through GoFundMe, there may be an ethics investigation or violation in their future. Furloughed federal employees using GoFundMe or other media outlets to raise money due to lack of a paycheck may be violating ethics rules that apply to federal employees. OGE may decide these requests for money from self-identified federal employees are within the ethics guidelines. The agency could change the rules. OGE could also find these employees to have violated ethics requirements but only admonish them. No one really knows how it will play out. There is also a prohibition on a federal employee receiving a cash gift of more than $20. Gifts totaling a few thousand in response to a request for cash may raise questions in an employing agency. There is also a question of “dual compensation” for a federal employee. While there are plenty of news articles about the lack of a paycheck, those not receiving money now will still get paid by the government in the future (whether working or on furlough). Assuming the government check is accepted, federal lawyers may be looking into these issues when the government returns to normal. On the other hand, it may be easier and less disruptive to take out a temporary loan instead of taking a public action that may result in an ethics investigation in your future. A short-term loan may create fewer personal problems when life in the federal bureaucracy returns to normal. There are several bills introduced that could come to play a role in this. Check out the related columns at the end of this article. A number of comments were received from readers. Here are several of the most typical comments from FedSmith readers. We wish everyone the best in dealing with the current disruption and uncertainty in their lives. Hopeful the shutdown will end soon. A lot of stress for myself and family. Wife in the hospital, no paycheck, furnace problems needing to be repaired along with record snow storm and record cold. Folks, this is why you need to have an emergency fund, a working spouse, and current skills that are marketable outside of government. I live below my means. I’m fine financially. I’ve spend (sic) my days off doing house projects and training for an upcoming ultra-endurance bicycle race I’ve got in March. The furlough is actually working in my favor and making me think how nice retirement will be. Looking at new jobs outside of the government. I am spending all my time working full-time on a JFK Airport checkpoint, gratis. I don’t have youth on my side so I don’t see myself holding down another job and if I did, what are my chances a potential employer will accommodate my odd schedule when he knows I will be eventually quitting when the furlough ends? Reorganizing my house, being with family, but now starting to look for another job as there is no end in sight. My husband is retired and our daughter is back home for a few weeks while she does her clinicals towards her DPT degree… so it’s been “family time”. Our house is already paid off so finances are not really an issue. Enjoying the security of financial planning from the discipline of having 6 + months of disposable income saved. Very depressed about the whole shutdown, I enjoy work and staying home all day is driving me nuts, and my wife who stays home ..well were are getting on each others nerves.